This fall, Fleet Feet Sports is highlighting the positive effects of running. One of the ways we are doing this is by giving back to our community, and we're looking to make a big impact! of certain products as part of our Power Of Running For Good initiative. We will be giving parts of our proceeds to Human Powered Delray, a local charity who aims to help make Delray Beach a more Pedestrian friendly city! For more infor on Human Powered Delray click here. When running wasn’t about the miles, the pace, or the training it was just about Recess! Starting in September as part of our Power of Running initiative we will be holding Recess Runs! When you go back and think about when was the first time you had fun running as a kid, you can bet it was during that hallowed time in the middle of your school day called Recess. Everyone loved being able to go outside and run around with all your friends from different classes playing the classics of tag, red rover, and other blissfully juvenile games. Running together allows us all to share in the experience that make running a fun, and challenging activity. By running with family and friends you get to share all of the highs and lows of running whether that is reveling in personal best race or having someone there to help push you through a particularly difficult training session. By being able to share these experiences it solidifies our resolve and strengthens our love and commitment to running and running together. We believe its widely known that running can be a powerful tool for inspiration. Whether it be fro a cause greater than oneself such as the Run/Walk for a Cure series of events to raise money for breast cancer awareness or it being the story of one person's determination to achieve something in life that no one thought would be possible in their condition. 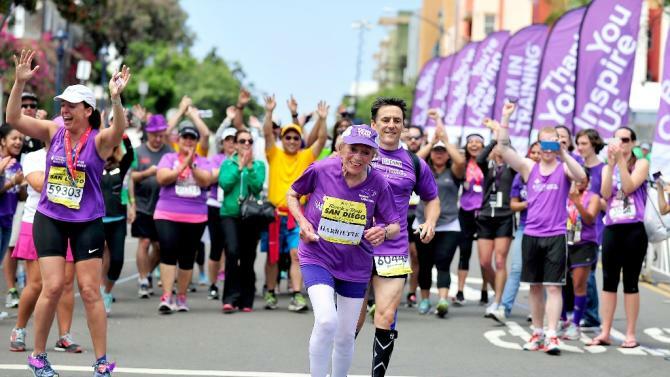 For the latter example there is Harriette Thompson who finished the Rock 'n' Roll San Diego Marathon in 7:07:42, the fastest time on record by a woman age 90 or older. You can read more about her story in a brief, but informative article in Runner's World here.